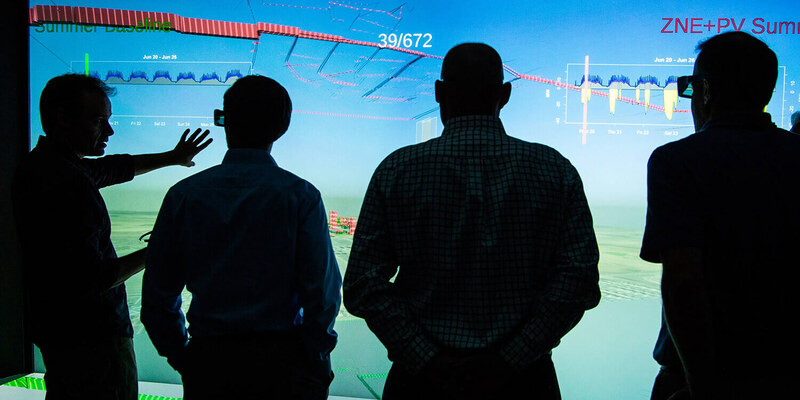 NREL Senior Scientist demonstrates ongoing 3D analysis research in the Insight Center Visualization Lab at the ESIF to members of the Wells Fargo Corporate Properties Group. simuwatt, another IN2 innovation which reached completion, is a web- and tablet-based application that allows users to rapidly find potential energy savings for building operators. While the product has been available commercially for a year, its most recent version includes enhancements to simplify and advance energy modeling and analysis. NREL researchers assisted simuwatt to improve its application by “integrating the platforms to generate models, then calibrating the models, and lastly, providing them with a library of efficiency measures that they could apply to a building to see how those would pencil out for a particular owner,” Larry Brackney, NREL Senior Researcher, said. As a result, the application further completes the function researchers originally envisioned. ThermoLift called on NREL’s system and building modeling expertise to help bound the performance potential of various product development scenarios for its natural gas-driven heat pump. The company is continuing to develop a natural gas-driven heat pump and air conditioner to replace building heating, cooling, and hot water systems with a single appliance. J2 Innovations realized the potential of connected buildings with its new framework software—Fluid Integration (FIN)—which injects the Building Automation System (BAS) with the benefits of a Building Operating System (BOS) to manage and leverage data. IN2 stepped in to help with retro-commissioning using the associated visualization to show energy and cost saving opportunities. Additionally, J2 Innovations recently announced its acquisition by Siemens. 7AC Technologies (7AC) is ready to offer a new approach to air conditioning technology—which represents nearly 50% of total energy consumption in commercial buildings—through its liquid desiccant technology. Throughout their project, NREL researchers helped improve 7AC’s liquid desiccant heat exchanger design and tested the product across a wide range of climate conditions. As companies wrap up their IN2 projects, they have the option to complete close-out webinars to the broad program ecosystem of Channel Partners, Wells Fargo executives, and industry partners. LiquidCool, Go Electric, simuwatt, and J2 Innovations all opted in for a close-out webinar – if interested in receiving a copy of their webinar recording or project related technical reports, please send a note to IN2@nrel.gov. Stayed tuned for more news on portfolio companies who may enter into beta demonstration discussions with the IN2 program, following their initial project. The programs expansion last year with an additional $20 million boost from Wells Fargo Foundation has only strengthened its initiative focused on commercial building startups and has now successfully helped deliver the promise of real, lasting impact through innovative renewable energy technologies to market. The next cohort of innovators in commercial buildings is expected to be invited to the program in September 2018.